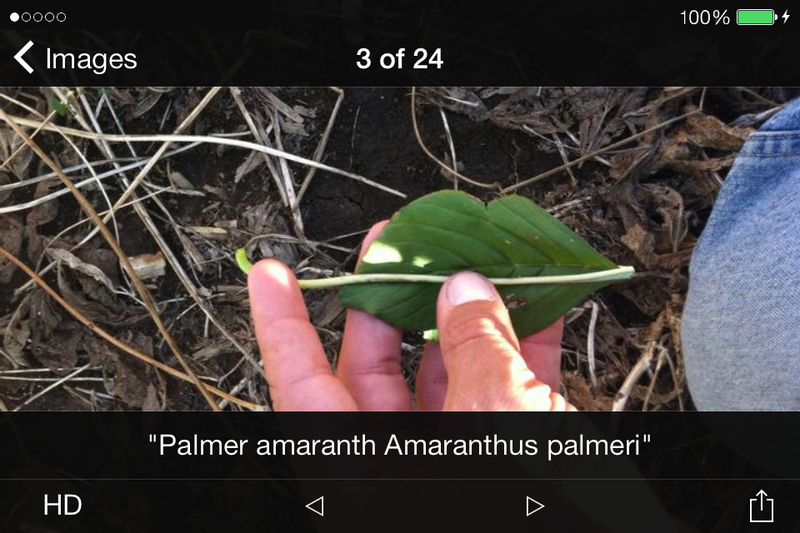 The IPM Toolkit app is news and media reader available free for smartphone and tablet users. 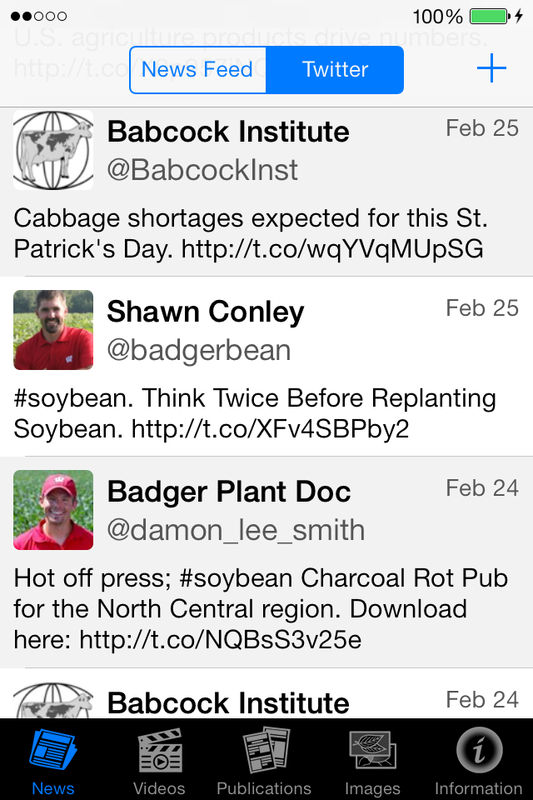 This app is brought to you by the University of Wisconsin’s Integrated Pest Management (IPM) program. Following IPM practices is a sustainable approach that helps farmers maximize the use of pest prevention, avoidance, monitoring and suppression strategies, minimizing economic, health, and environmental risks. NEW feature: A very easy YouTube channel search function has been added. It is now easier to add your local state extension or university playlist of videos. see an alert about soybean aphid infestation on the rise. view a video about soybean aphid scouting. 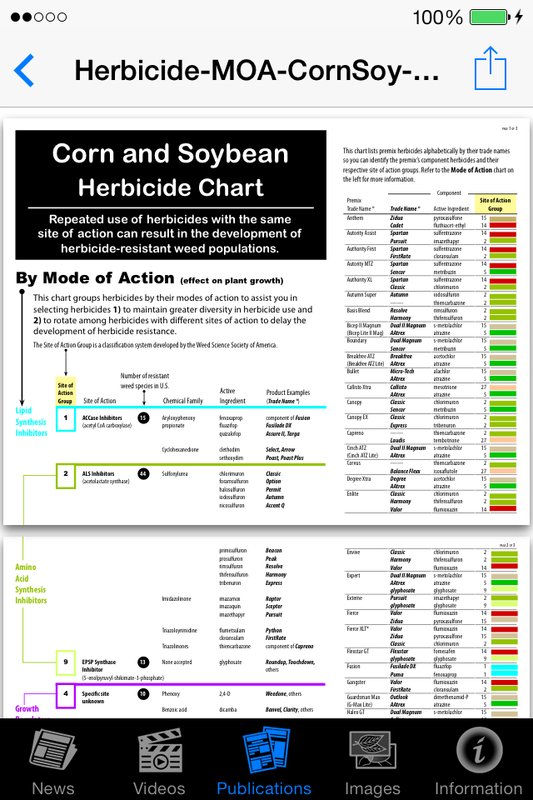 look up soybean aphid management in a publication. 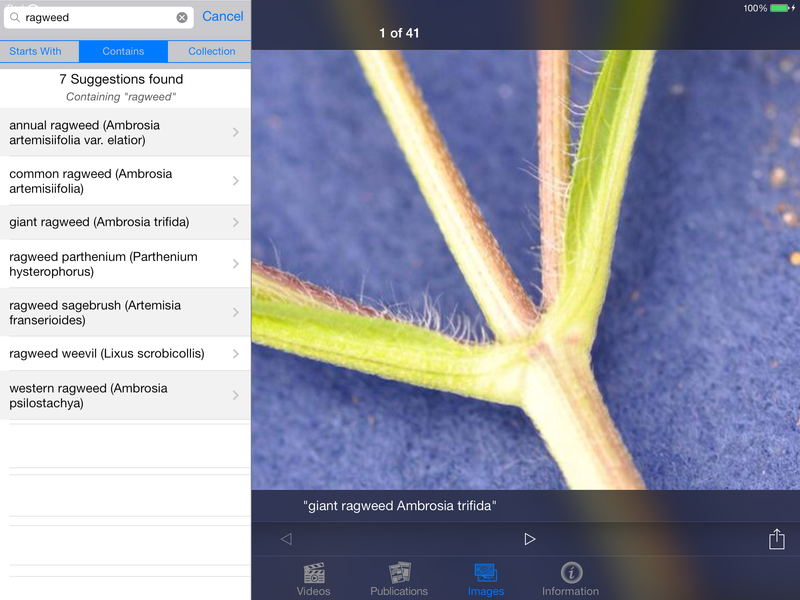 search for pictures related to soybean aphids or scouting in the app’s online image database. create an email or social media post that contains pictures or links to what you have learned. You can do it all inside this one app using your smartphone and the internet when ever you want or where ever you might be. Mobile device and internet use is changing how global and local agriculture operate and expand their businesses. Growers in Wisconsin and other states, like the rest of the world, are increasing their use of smartphones and other handheld devices for communication and information management on their farms. A key to agriculture’s continued success is incorporating information from an unbiased science and research-based university source. 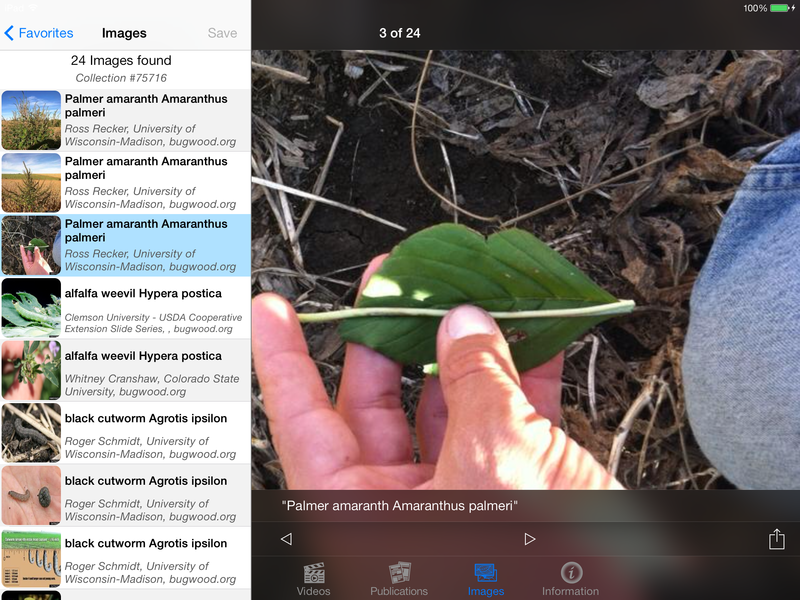 The app comes with a “featured collection” of pictures already saved in the “favorites” area where you can save your own favorite searches. 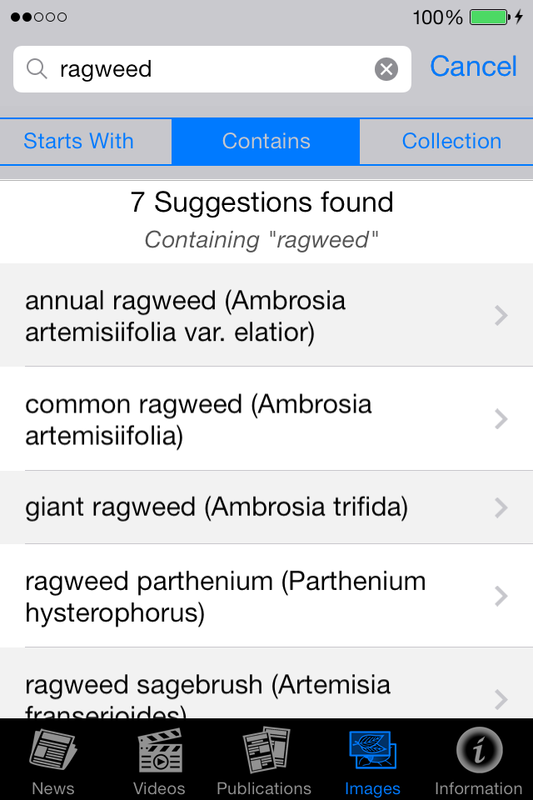 When you tap in the search input box, you type in the common or scientific name for a pest of interest to you. You may search using a partial name by typing in at least three letters and tapping “Search” on the keyboard. The app will return a list of suggestions based on your search letters. Tap one of the suggestions to see a list of thumbnail images based on that subject. Tap a thumbnail to see a full screen image. An “HD” button will be active for a higher resolution version of the image. You can copy, save or email images. Tap “Save” to add this collection to your list of saved searches. To view your list of saved searches, tap “cancel” next to the search input to indicate you are finished typing in search words. The featured collection and any searches you saved are now in the list, which you can edit or email. News Feed: Click the “+” button in the top right corner of the screen to add your own local news feeds. You can edit feeds you added by tapping the blue “i” button on the right side. 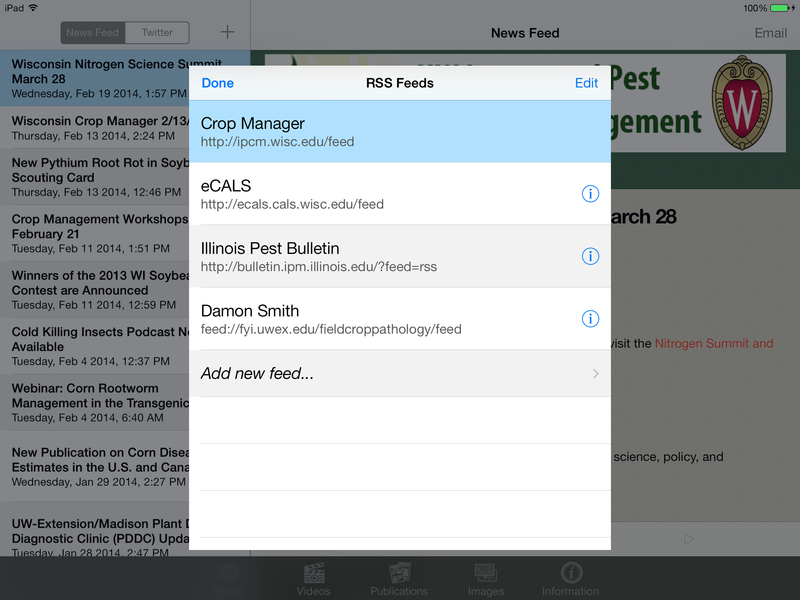 Default is https://ipcm.wisc.edu/feed/ This app is compatible with WordPress RSS feeds. Other news feeds may not work at this time. Twitter: Click the “+” button in the top right corner of the screen to add your own local Twitter lists. Google “using twitter lists” to learn about lists, or ask your local IT helper to help you find a list for your region. Default is https://twitter.com/wiscropman/wisag This app uses Twitter lists, not individual Twitter names. A Twitter list is comprised of multiple Twitter names in one list. Videos: Click the “+” button in the top right corner of the screen to add your own local YouTube playlists. You can type in the name of your state or university to search for a playlist of local educational videos. 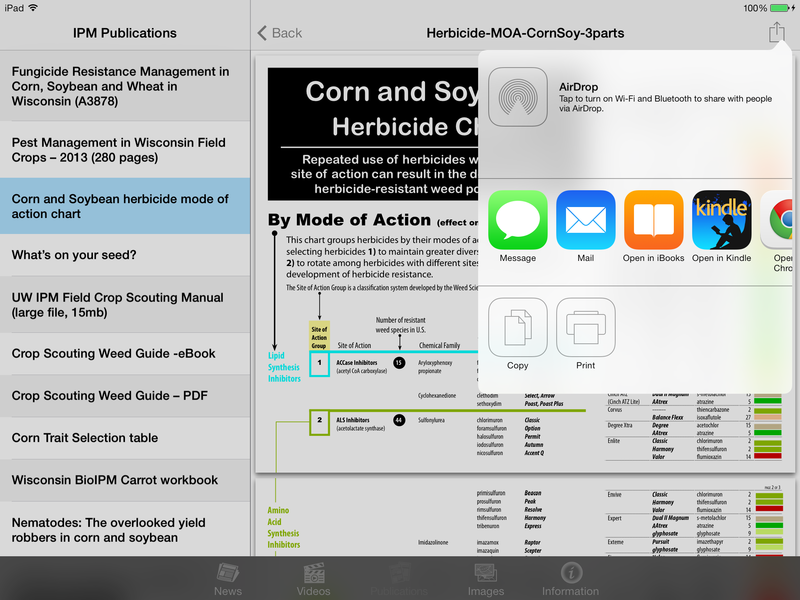 For example, you could type in – Wisconsin IPM.